On Sunday 21st January, Cheshire wedding venue, The Courthouse, located in Knutsford, Cheshire, will open its doors to future brides and grooms for a unique bridal open day. We’d love to hear from you if you’re a wedding blogger and interested in joining us at the event! 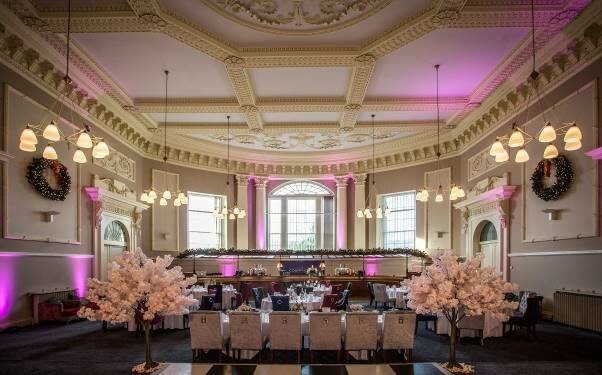 Set for a civil ceremony and a wedding breakfast, The Courthouse will open its doors from 12.00pm til 4.00pm, when couples will be able to see the magnificent venue, sparking the imagination of guests in preparation for their big day. Visitors will be met with a glass of fizz on arrival and served a selection of delicious canapés. The Courthouse is the perfect setting for a lavish, elegant occasion in the extravagant Court Room, or a smaller, intimate affair in the Moneypenny Suite. The hotel launched last summer and is set to become one of the most desired wedding venues in the North West. The Courthouse is a stunning Grade II listed building, originally designed by famed architect George Moneypenny, built in 1818. The stunning former Crown Court was acquired by Flat Cap Hotels in 2010 who undertook a careful renovation, restoring the history and grandeur. The three-storey Georgian property boasts hand painted ceilings and wood panelled walls alongside an awe-inspiring domed glass ceiling. The imposing columns on the front steps of the building provide the perfect back drop for wedding photography. The Court Room has a reception capacity of up to 200 guests and the Moneypenny Suite and six other suites accommodating 10-100 guests. The Courthouse is able to hold civil ceremonies, and is ideally located opposite the town’s beautiful St John’s Church and a short walk to Knutsford Methodist Church and Brook Street Chapel. Ten bedrooms will open later this year, with a further 40 bedrooms coming online in 2018. The Courthouse is nestled in the heart of Cheshire, easily accessible by car, just 2 miles from Junction 19 of the M6 motorway and 20 minutes from Manchester Airport.